Know who you are dealing with. We still see lots of illegal cars come into the US. Many stolen cars end up overseas The kind of people that don't care about the basic laws, don't care about any of the laws. If the documentation looks funny or strange, call US Customs. A Florida titled Skyline, you had better have a really good look at the HS7, 3520-1, and a copy of the foreign title document. This happened recently in Thailand, but happens all over the world. 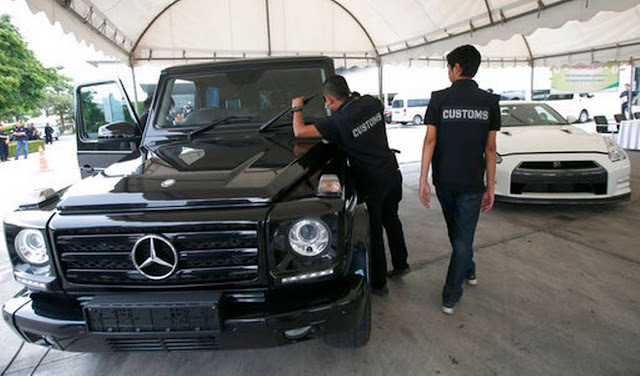 Thai customs officials said Friday they have seized 15 of 42 luxury cars that British authorities said were stolen and sent to Thailand. A request from British authorities to find stolen cars believed to have been transported to Thailand has led to the seizure of 122 vehicles imported by Thai dealerships. Of those, 15 were found to be stolen in the U.K. Thai customs officials say they are investigating about 300 other vehicles suspected to have been illegally imported. Customs officials displayed a Mercedes GLE 350 and a Nissan GTR at a news briefing Friday, part of the batch sought by Britain. The customs bureau said the cars were seized when their Thai importer attempted to ship them out of Thailand to evade officials. Kulit Sombatsiri, director-general of Thai customs, said the vehicles that British authorities are seeking were partially paid for in monthly installments by U.K. buyers before being sold on the black market. "The buyers only paid around 5 or 10 percent of the car's cost and they would then sell it," he said. "In the United Kingdom, they classify these cars as stolen." Police raids on May 18 and 22 resulted in the seizure of 122 cars that included luxury brands such as Lamborghini, Rolls Royce, McClaren and Lotus. Of the 122 cars seized, 31 Lamborghinis and a Lexus were declared to Thai customs as cheaper models than they actually were, which amounted to around 650 million baht ($19 million) worth of losses in tax collection, police said. Further investigations revealed that eight of 11 Lamborghini Aventadors imported from the U.K. were registered with Thai customs as the cheaper Gallardo model. Two other Lamborghinis were registered as being shipped partially assembled from the U.K. and later assembled in Thailand. Police suspect the cars were fully assembled before they were shipped. Cars that are delivered in parts to be assembled in Thailand can be taxed up to 80 percent of their value while authorities can tax fully assembled imports up to 328 percent.